Department of Pathology, IMS &SUM Hospital, Bhubaneswar, India. Received: December 29, 2015; Revised: January 21, 2016; Accepted: February 9, 2016; Published online: March 27, 2017. A 58-year-old man presented with a 1-year history of transfusion-dependent anemia. On examination, he had pallor and his spleen was barely palpable. A complete hemogram showed the following: hemoglobin, 5.4 g/dL; mean corpuscular volume, 114.1 fL; mean corpuscular hemoglobin, 34.6 pg; mean corpuscular hemoglobin concentration, 30.3 g/dL; total leucocyte count, 4.1×109/L; and platelet count, 867×109/L. A blood differential count showed 40% neutrophils, 54% lymphocytes, 2% monocytes, and 3% eosinophils. A peripheral blood smear showed dimorphic red cells, marked thrombocytosis, and platelet anisocytosis (A). His serum vitamin B12 level was 400 pg/mL. 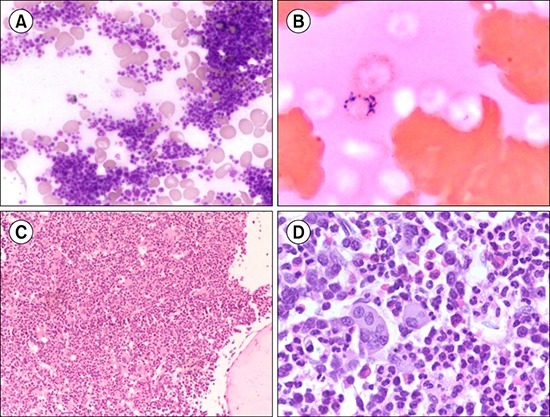 A bone marrow aspiration showed mild dyserythropoiesis and dysmegakaryopoiesis, while a pearl stain for iron showed >15% ringed sideroblasts (B). A bone marrow trephine biopsy showed megakaryocytic hyperplasia, focal clustering of megakaryocytes (C), and hyperlobated megakaryocytes (D). Conventional karyotyping showed a normal male karyotype. A diagnosis of refractory anemia with ring sideroblasts and thrombocytosis (RARS-T) was made, and the patient was kept under follow-up observation. RARS-T is a new, provisional entity that belongs to the unclassifiable category of myelodysplastic/myeloproliferative neoplasm syndromes and demonstrates both morphological features of RARS, along with thrombocytosis (platelet count >450×109/L) and evidence of hyperlobated megakaryocytes. The presence of myeloproliferative component is also highlighted by the fact that the majority of cases are associated with presence of JAK2 mutations. Therefore, a high degree of suspicion is needed to properly diagnose these rare overlap syndromes, which show features that are common to both myelodysplastic and myeloproliferative neoplasms.